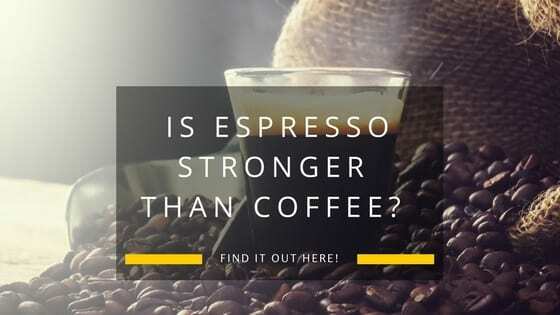 » Is Espresso Stronger Than Coffee? Find Out Here! Is Espresso Stronger Than Coffee? Find Out Here! Is Espresso Stronger Than Coffee in terms of Taste? Is Espresso Stronger Than Coffee Despite it's Faster Brewing Method? Is Espresso Stronger than Coffee in terms of Acidity? Is Espresso Stronger than Coffee Based on TDS? I bet you have heard many times the question "Is espresso stronger than coffee?" It is indeed a very common question among coffee aficionados. I would argue that the reason is because the answer is not so straight forward and requires some more digging into the matter. The common perception is that espresso is stronger than coffee. 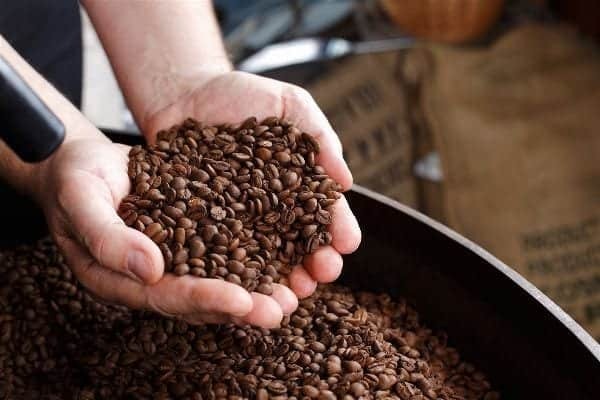 But if we dig a bit more we realize there are several factors to be taken into consideration to determine which one is stronger, such as the type of roast, the coarseness of the grind, the brewing time, the caffeine content, the acidity and the the total dissolved solids. Let's find out what each one of these factors does and how impacts the strength of the coffee. But first of all, let's be clear that espresso is also a coffee. Espresso is a different method of brewing that uses pressure, with the aid of an espresso machine. This is contrary to the popular belief that espresso is a type of roast. However, since most people consume brewed coffee, they tend to refer to brewed coffee when talking about "coffee" in general. And according to a statistics, there's only around 30% of adults who consume espresso and espresso-based beverages. Let's discuss the key factors that differentiate coffee (brewed coffee) from an espresso before we can answer our main question. So, the question above actually goes: "Is espresso stronger than brewed coffee?" For better understanding, we have to know first the differences between an espresso and drip coffee. A brewed coffee is made by extracting the freshly ground coffee using hot water. There are different ways to brew your coffee, some people use a filter, others prefer to use French Press or Chemex. On the other hand, espresso can still be considered as a brewed coffee because it was also extracted using a hot water. However, unlike the traditional way of brewing by just waiting for the hot water to seep through the coffee grounds, espresso uses pressure. Since espresso needs pressure to be able to extract in about 25 seconds, this can't be done manually. Hence, we need an espresso machine to produce at least 9 bars of atmospheric pressure. Compared to brewed coffee, creating a perfect shot of espresso requires skill and some level of expertise. Having the best espresso machine doesn't guarantee you the best tasting espresso. You will also need a skilled barista to determine the right grind, and do the right tamping. These factors, along with the ideal water temperature (200 degrees Fahrenheit) will determine the quality of your espresso. Other terms for French Press include the coffee plunger, press pot, or Melior. To brew using a French Press you will need a thermometer, timer, and a coffee grinder. The French Press requires a coarser grind and the ideal water temperature of around 200 degrees Fahrenheit. To start, you just need to place your ground coffee to the pre-heated French press, then gradually pour the hot water (200 degrees Fahrenheit), and just let it steep for about 3 - 6 minutes before pressing the mesh filter. You may now transfer it to your drinking cup or mug. Check out this great video to learn more on how to brew with a French Press. Another way to come up with a drip coffee is by using a Chemex Coffeemaker. Unlike the Frech Press, which uses a mesh filter, the Chemex coffeemaker uses a thick paper filter to avoid transferring the coffee grounds into your coffee. You just need to place the coffee grounds on to the thick paper filter, wet the ground coffee before pouring the desired amount of hot water. The filtered coffee will then drip into the flask placed under the paper filter. Brewing your coffee using a coffee percolator only requires a freshly ground coffee and a tap water. You just need to put tap water on the bottom part of your coffee percolator, and the ground coffee beans on its designated spot. After a few minutes of perking over a stove, the coffee percolator will then produce your brewed coffee. This video will teach you more on how to brew with a percolator. Considering we talk about the good quality brewed coffee and espresso, and not the burnt ones, an espresso usually has a stronger taste compared to brewed coffee. And below are some of the factors that made espresso stronger than coffee. Medium Roast - Roasted between 410 to 430 degrees Fahrenheit and also called as the Breakfast or American Roast. Medium Dark Roast - Roasted between 435 to 445 degrees Fahrenheit and also called as Full City Roast. Dark Roast - Roasted between 465 to 485 degrees Fahrenheit and also known as Italian, Espresso, Vienna, French, or Spanish Roast. The first difference of a traditional espresso vs coffee lies on the type of roast used. Since brewed coffee uses a lighter type of roast than espresso, the taste hugely differs. However, all these types of coffee roast can be used for both brewed coffee and espresso. The taste can be adjusted by the coffee drinker according to his / her preference. After knowing the difference on types of roasts, we also have to know the difference in the grind size between espresso and coffee. This factor is very important because this might lead to under extraction or over extraction if not properly observed. For an espresso, it uses a fine grind because it allows the pressured water to brew the grounds thoroughly, given the 20 to 30 seconds extraction time. Espresso's grind size is finer than sugar but coarser than flour. If you will use a coarser grind, it will result in under extraction, with weak crema. And if you will use a finer grind, your espresso will be over extracted and will taste bitter and burnt. For brewed coffee, the grind size varies when using different types of equipment or a different method. But the grind size for brewed or drip coffee is usually coarser than that of espresso. For a French Press, since it brews by immersion, the grind size should be coarse (same size as a kosher salt). This allows the water to extract just the right amount of water solubles from your coffee grounds. And if you will use a finer grind size for your French Press, the mesh filter might not be enough to separate the grounds from your coffee. But the coarser grind will result in a weaker coffee. For a Chemex Coffeemaker, the ideal grind size is medium-coarse, wherein coffee grounds should be about the size of a table salt. Though an espresso machine brews an espresso in as fast as 20 - 30 seconds, it still tastes stronger compared to brewed coffee because of the pressure applied. When brewing coffee using a French Press, a Chemex coffeemaker, or a coffee percolator, brewing time takes a couple of minutes. And people usually extend the brewing time to adjust the taste according to their coffee preference. With espresso, the tamping, water temperature, and the grind size determine the length of the brewing time. If we answer the question " Is espresso stronger than coffee" based on taste, the answer is yes. But if we referred to its caffeine content as the basis for the strength, the answer is no. Some people find it confusing, though. Put it like this: if we compare an ounce of espresso to an ounce of brewed coffee, espresso has higher caffeine content. 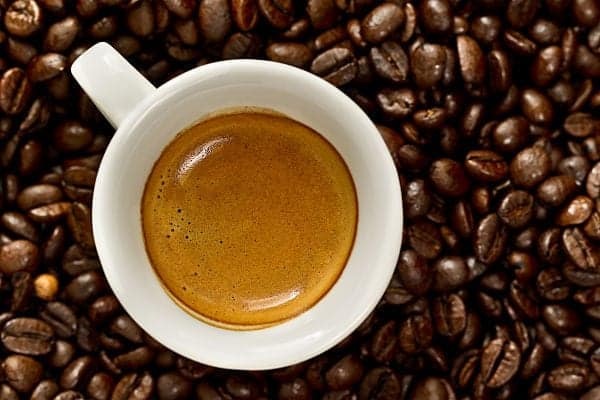 An ounce of an espresso shot caffeine content is only 30 - 50 milligrams (mg.), while an ounce of drip coffee contains only 8 - 15 milligrams (mg.) of caffeine. However, the usual serving size makes the difference. Americans usually consume 8 - 12 ounces of brewed coffee, but a fancy drink like latte or cappuccino has an ounce or two of espresso. Well, who drinks 8 ounces of pure espresso? This means, an 8 ounce brewed coffee contains approximately 64 - 120 milligrams (mg.) of caffeine, higher than the 30 -50 milligrams (mg.) caffeine content of a single shot espresso. By the way, did you know that American soldiers actually invented Cafe Americano by adding water into espresso, and make it taste like brewed coffee? 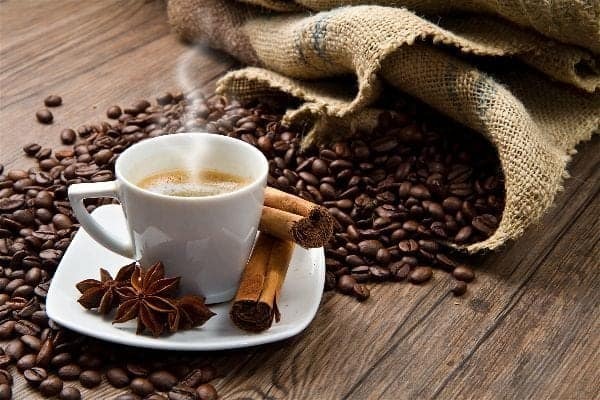 People think that espresso has a higher amount of caffeine because of its bitter taste, but the reason the dark roast is bitter is that of an antioxidant called phenylindanes. Americans tend to consume brewed or drip coffee from 8 ounces up to 31 ounces. The caffeine content remains the same if we will compute it per fluid ounce. This is why we use mugs when serving brewed coffee, and a demitasse cup when serving espresso. Aside from these four serving sizes, espresso is also the base of specialty coffees like Cappuccino, Latte, Mocha, and Cafe Americano. In a chart shown by Hofman, the coffee becomes more acidic as the roast gets darker. The bracket of usual coffee acidity is from 4.7 to 5 on the pH scale, and the dark roast reaches as high as 5.1 pH level. And as discussed above, usual brewed coffee uses Light to Medium Roast, while traditional espresso uses Medium Dark to Dark Roast. So, if we will use acidity as the measure of strength, then, yes espresso is stronger than coffee. TDS (Total Dissolved Solids) is another way to measure the strength of coffee, by means of identifying the number of volatile oils and organic acids in your cup.  Espresso has 7 to 12 percent of total dissolved solids (TDS), while a brewed or drip coffee only has 1.2 to 1.8 percent. The espresso contains more TDS particularly because of the pressure-brewing, the finer grind compared to French Press, and its brewing temperature. And the total dissolved solids are responsible for the flavor, richness, and boldness of our favorite cup. An article posted in The Coffe Bump implies that if you want to intake more caffeine, then drink brewed coffee. But if you want to get all the antioxidants and micronutrients of coffee with lesser caffeine, you might want to go with espresso. Well, the health benefits still vary from person to person, it's still best to first seek your doctor's opinion. The main point of this article is to answer the question "Is espresso stronger than coffee?" In terms of taste, the espresso is bolder, richer, and stronger compared to brewed or drip coffee because of the pressure-brewing, the type of roast, fineness of its grind, and its higher Total Dissolved Solids percentage. The espresso has extracted more flavors from the ground coffee compared to drip coffee. But when it comes to caffeine content, if we will base it on the caffeine content per ounce, espresso has higher caffeine. And if we will base it on the serving size, the 8-ounce espresso contains a higher amount of caffeine than a double shot espresso. Overall, espresso is stronger than coffee in so many ways. But in terms of caffeine, it's a bit technical. If you enjoyed the information in this post or wish to take part to the discussion, just feel free to share your thoughts in the comments section below.